(Galérie Alexandre Iolas, Paris); sold 1966 to Mr. and Mrs. Paul Mellon, Upperville, VA; gift 1985 to NGA. René Magritte, Museum of Modern Art, New York; Rose Art Museum, Brandeis University, Waltham, Massachusetts; Art Institute of Chicago; Pasadena Art Museum; University Art Museum, University of California, Berkeley, 1965-1966, no. 82, repro. 19th and 20th Century French Painting from the Collection of Mr. and Mrs. Paul Mellon, Virginia Museum of Fine Arts, Richmond, 1979 (long term exhibition), checklist no. 46. René Magritte, Fondation de l'Hermitage, Lausanne, 1987, no. 118, repro. René Magritte, Kunsthalle der Hypo-Kulturstiftung, Munich, 1987-1988, no. 129, repro. 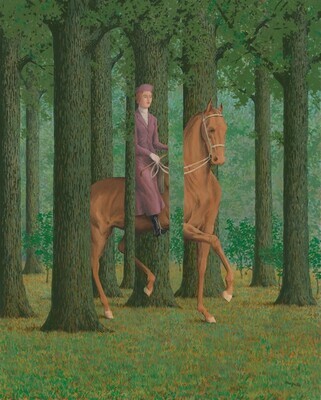 Magritte, The Hayward Gallery, London; The Metropolitan Museum of Art, New York; The Menil Collection, Houston; Art Institute of Chicago, 1992-1993, no. 125, repro., as Le blanc-seing or Carte blanche. René Magritte, The Montreal Museum of Fine Arts; Kunstsammlung Nordrhein-Westfalen, Düsseldorf, 1996-1997, no. 136, repro., as Carte Blanche [Montreal catalogue], and no. 103, repro., as Le blanc-seing (Die Blankovollmacht) [Düsseldorf catalogue]. René Magritte 1898-1967, Musées royaux des Beaux-Arts de Belgique, Brussels, 1998, no. 229, repro. René Magritte, The Bunkamura Museum of Art, Tokyo; Nagoya City Art Museum; Hiroshima Museum of Art, 2002, no. 69, repro. Magritte, Galerie Nationale du Jeu de Paume, Paris, 2003, unnumbered catalogue, repro. René Magritte. The Key to Dreams (René Magritte. Der Schlüssel der Träume), Kunstforum Wien, Vienna; Fondation Beyeler, Basel, 2005, no. 96, repro. Visual Deception, Nagoya City Art Museum; The Bunkamura Museum of Art, Tokyo; Hyogo Prefectural Museum of Art, Kobe, 2009, no. 105, repro. El mundo invisible de René Magritte [The Invisible World of René Magritte], Museo del Palacio de Bellas Artes, Mexico City, 2010, unnumbered catalogue, repro. Strick, Jeremy. Twentieth Century Painting and Sculpture: Selections for the Tenth Anniversary of the East Building. Washington, D.C., 1989: 102, repro. 103. Gilbert, Rita. Living with Art. 5th ed. New York, 1998: fig. 9.